With the World Cup on every television, computer, smart phone, magazine and newspaper, it is only natural for a Brazilian recipe to turn up on our little blog. For the last few weeks, we’ve been researching (this really means eating) our way through Brazilian dishes. 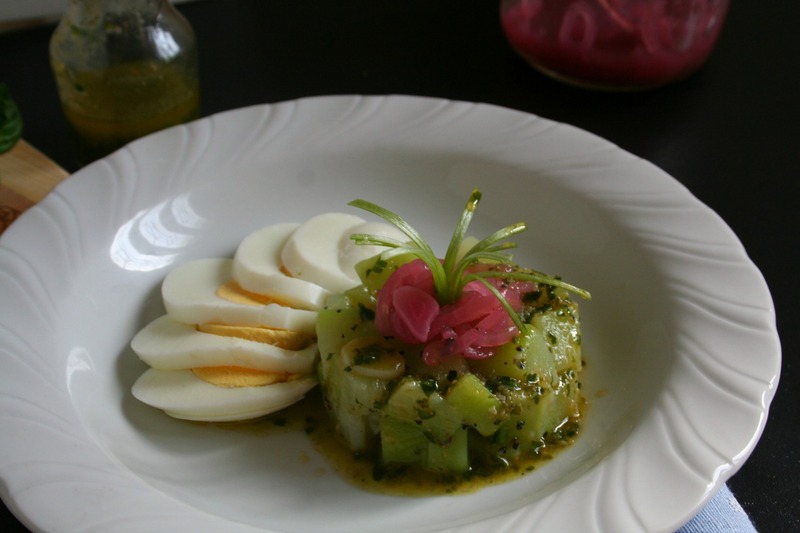 We absolutely loved this chilled Brazilian Chayote Salad for its simple flavors. The soft garlic kissed chayote really is the star in this dish. Xuxu or chuchu, pronounced shoo-shoo in Brazil, is also known as a chayote. This popular squash grows everywhere in Brazil, making it a staple in the Brazilian diet and is used in fritters, soups, soufflés and salads like this. Chayote can have a pleasant crunch when raw or gains a soft, almost creamy texture when cooked. Typically bland in flavor, chayote can absorb vinaigrettes quite well, making them ideal for cold salads. Did you know that “chuchu” is also a term of endearment in Brazil? 1. Add the chayote, water, sliced garlic, salt and pepper to a medium sauce pot. Allow to come to a boil over medium heat. Continue to cook until fork tender, about 10 minutes. 2. Drain the chayote, placing the chayote in a bowl to chill in the refrigerator, covered, for one hour. 3. Make your basil vinaigrette: whisk together the minced garlic, basil, vinegar while drizzling in the oil. Season to taste with salt and pepper. Reserve. 4. Gently toss the chayote in the basil vinaigrette until fully coated. Mix in the hard-boiled eggs or serve alongside the finished salad. Garnish with chives and pickled red onions.